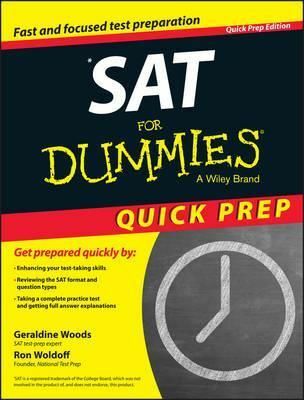 Sat For Dummies 2015 Quick Prep 9Th By Woods, G.
The Fast And Easy Way To Score Higher On The Sat Does The Thought Of Preparing For The Sat Cause You To Break Out In A Cold Sweat? Have No Fearsat For Dummies, Quick Prep Edition Gives You A Competitive Edge By Fully Preparing You For The Sat. Written In A Friendly And Accessible Style, This Hands-On Guide Will Help Increase Your Chance Of Scoring Higher On The Redesigned Sat Test Being Launched By The College Board In 2016. The Sat Is Administered Annually To More Than Two Million Students At Approximately 6,000 World-Wide Test Centers. Nearly Every College And University In America Looks At A Student'S Sat Exam Score Or Sat Subject Tests As A Part Of Its Admissions Process. Your Sat Score Is Nothing To Sniff At In Addition To Admissions, Many Schools Use These Results For Course Placement. With The Help Of This Guide, You'Ll Maximize Your Chances Of Gaining Entrance To The College Of Your Dreams As Well As A Seat In The Best Classes. So What Are You Waiting For? Start Practicing Your Way To A Better Sat Score Today!